Happy Synergy Blend: Blended with pure ? Pink Grapefruit (Citrus paradisi) ? Lemon (Citrus limonum) ? Cassia (Cinnamomum cassia) ? Ginger (Zingiber officinalis) ? Peppermint (Mentha piperita) Characteristics: This blend is sure to create a happy and warm ambiance in any home, room, office or car. Amazing pick me up blend. Anti depressant, reduces cellulite when diluted properly. Slight aphrodisiac. Very bright and cheerful blend. Name: Stress Relief Synergy Blend * Contains: Bergamot (Citrus bergamia), Patchouli (Pogostemon Cablin), Sweet Orange (citrus sinesis), Ylang ylang (Cananga Odorata), Pink grapefruit (Citrus paradisi), Gurjum (Dipterocarpus turbinatum) Characteristics: Stress Away blend is an excellent blend to uplift and relax individuals who are in need of stress relief. Bright and soothing a must have blend. It works well in a nebulizing diffuser at the office. Usage: This synergy blend contains 100% pure essential oils. We recommend a 3 to 5% dilution for topical body applications. * Cautions: It is possible that this blend may cause sensitivities; users are recommended to use these blends only in dilution and not as a replacement for traditional medicine. Deep Muscle Synergy Blend: Blended with pure ? Wintergreen (Gaultheria Procumbens) ? Peppermint (Mentha Piperita) ? Eucalyptus (Eucalyptus Globulus) ? Camphor (Cinnamomum camphora) Characteristics: This blend combines powerful analgesic oils designed to mitigate pain and discomfort. This is a powerful oil and should be diluted with a carrier oil prior to application. Natural therapeutic solution to the challenges of muscle discomfort. Eases achy joints and sore muscles. Its effects are deep, cool and penetrating with lasting therapeutic results. New Beginning Synergy Blend: Blended with pure ? Sweet Orange (Citrus Sinensis) ? Lemon (Citrus limonum) ? Spanish Rosemary (Rosmarinus officinalis), Frankincense (Boswellia Serrata) ? Tea Tree (Melaleuca alternifolia) ? Eucalyptus (Eucalyptus Globulus) Characteristics: Refreshing and Buoyant this blend is a proprietary blend of oils designed to uplift and renew oneself. Bright and energetic this oil is for new beginnings. A various array of therapeutic oils that work synergistically. Excellent addition for any health conscious individual. Meditation Synergy Blend: Blended with pure ? Frankincense (Boswellia Serrata) ? Ho Wood (Cinnamomum camphora) ? Ravensara (Agathophyllum aromatica) ? Lemon (Citrus limonum) ? Camphor (Cinnamomum camphora) ? Yarrow Blue (Achillea millefolium) Characteristics: The oils in this synergy are believed to be useful in reducing stress and its side effects. A wonderful synergy to help promote relaxation. Not only will it help you to 'settle' yourself inside, it also has oils to help you feel more at ease and give you a sense of well being. This Blend is an excellent for centering and composure. Rare and exotic oils comprise this specialty blend. Citrus Blast Synergy Essential Oil Blend 10 ml. 100% Pure, Undiluted, Therapeutic Grade. (Blend Of: Sweet Orange, Lemon, Tangerine, Bergamot, Mandarin, Clementine, Vanilla). Citrus Blast Synergy Blend: Blended with pure ? Sweet Orange (citrus sinesis) ? Lemon (Citrus limonum) ? Tangerine (Citrus reticulata blanco var tangerina) ? Bergamot (Citrus bergamia) ? Mandarin (Citrus reticulata) ? Clementine (Citrus clementina) ? Vanilla (Vanilla planifolia) Characteristics: Helps strengthen the immune system and overall well-being while bringing about feelings of positivity. Diffuse at home or at work for a fresh, inspiring scent. Citrus Blast is great for eliminating cigarette smoke, stale air, and other unpleasant odors! 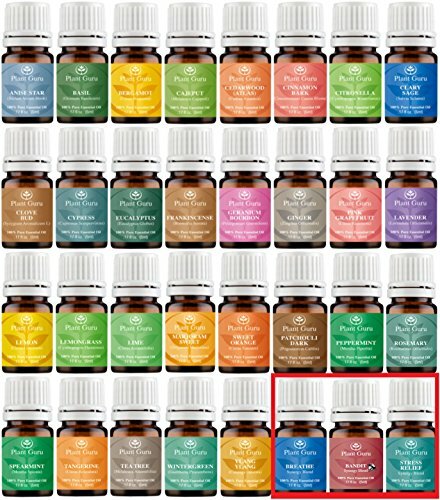 Ultimate Essential Oil Variety Set - 32 Pack - 100% Pure Therapeutic Grade 10 ml. Deep Forest Synergy Essential Oil Blend 10 ml. 100% Pure, Undiluted, Therapeutic Grade. (Blend Of: Siberian Fir Needle, Silver Fir Needle, Pine Needle, Cypress, Cedarwood. Deep Forest Synergy Blend: Blended with pure ? Siberian Fir Needle Oil (Abies sibirica ledeb)? Silver Fir Needle Oil (Abies Alba) ? Pine Needle Oil (Pinus sylvestris) ? Cypress Oil (Cupressus sempervirens) ? Cedarwood Oil (Juniperus mexicana). Characteristics: Deep Forest is a proprietary blend of 100% pure essential oils from the deep forests of Europe. Crisp and refreshing, this blend embodies the essence of pine, infusing an invigorating and purifiying aroma that is suitable for both cleansing and respiratory situations. Excellent in aromatherapy for expanding the lungs. Diffuse throughout the air to remove impurties and impart a fresh scent. When diluted this blend is used to treat various skin ailments most commonly noted with over oily skin. 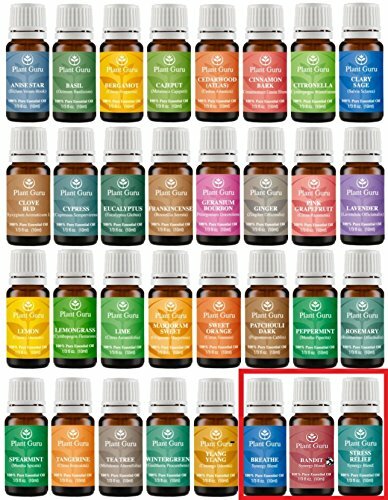 Premium Essential Oil Synergy Blends Variety Set - 14 Pack - 7 single & 7 Blends - Stress Relief, (Bandit "Thieves"), Alive, Happy, Meditation, New Beginning, Sleep Tight, Sweet Orange, Rosemary, Lemon, Lavender, Eucalyptus, Peppermint, Tea Tree. Name: Breathe Synergy Blend * Contains: Eucalyptus (Eucalyptus Globulus), Peppermint (Mentha Piperita), Tea Tree (Melaleuca alternifolia), Lemon (Citrus limonum), Lavender (Lavandula angustifolia), Cardamom (Elettaria cardamomum), Bay (Laurus nobilis)* Characteristics: This essential oil synergy blend contains oils that together increase the lungs capacity to help breathe. It works well in a nebulizing diffuser at the office. Usage: This synergy blend contains 100% pure essential oils. We recommend a 3 to 5% dilution for topical body applications. * Cautions: It is possible that this blend may cause sensitivities; users are recommended to use these blends only in dilution and not as a replacement for traditional medicine. For external use only. 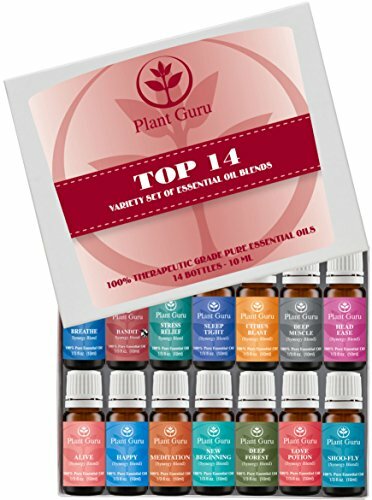 Premium Essential Oil Synergy Blends Variety Set - 14 Pack - 100% Pure Therapeutic Grade 10 ml. Set Includes 14/10 ml. Perfectly Blended Synergy Oils. 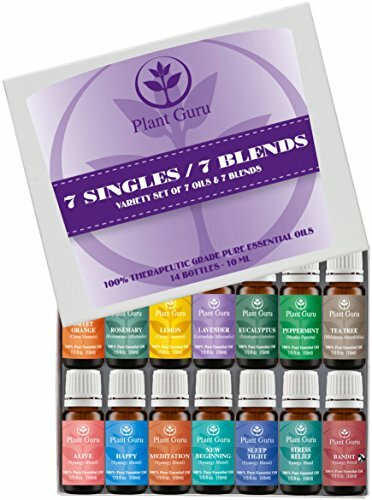 Premium Essential Oil Synergy Blends Variety Set - 14 Pack - 100% Pure Therapeutic Grade 10 ml. Set Includes 14/10 ml. Perfectly Blended Synergy Oils. Set Includes 14/ 10 ml. Bottles - Stress Relief, Breathe, (Bandit "Thieves"), Alive, Citrus Blast, Deep Forest, Deep Muscle, Head Ease, Happy, Love Potion, Meditation, New Beginning, Shoo Fly, Sleep Tight. Citrus Blast Synergy Essential Oil Blend 30 ml. 100% Pure, Undiluted, Therapeutic Grade. (Blend Of: Sweet Orange, Lemon, Tangerine, Bergamot, Mandarin, Clementine, Vanilla).